Boy, time flies when you’re having fun. I had the bike out after my last post about a week ago it, but while I did maintenance on the roadster so that I can start driving it soon. I got back to the StreetFox yesterday. I re-did the bars as they were too low and limited my turning radius quite a bit. I cut them off a couple inches out from the stem and re-oriented them similar to the direct steering bars on a Terra Trike. I bought a couple Mirro mirrors from the local bike shop and tried them first in the bar ends but had to move my head too far to glance at them, so I made a 3″ long post out of some more handlebar stock and positioned them close to the end of the brake levers. They look around my big self quite well, so that’s where they will stay. I hadn’t done a very good job on the first fitting of the Avid BB7 discs but I managed to get them sorted and cut out all the drag. They work fantastic. 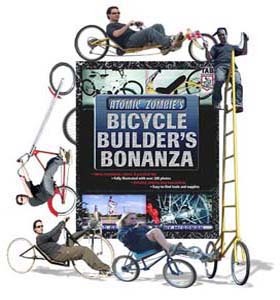 I like then so well I believe I will retrofit them to my Giant suspension bike when I rebuild it sometime this summer. It’s a 2002 that just rolled 5,000 miles and the gearing, chain, brakes and cables are due for rehab. So, I got the StreetFox out yesterday and road it a few miles. I’m surprised how heavy it is—around 50 pounds is my guess. I have a 300 limit scale in the shop. I weighed me at 251 and then stepped on it with the bike in my arms and it went TILT. Not much more I can do for that problem, but there is still a chunk of main rail to come off in front of the bottom bracket (BB) and a few more lightening holes I can place here and there. Pedal effort seems high, however the cranks are 5mm shorter than what I’m used to. The gearing is way off also. With it I hardly ever go up on the big ring unless I’ve got a really huge downhill. On the StreetFox I had to get a couple – three gears into that ring to feel about right. That’s something I will remedy when I find appropriate upgrades. When I first rode it a week or so back I had a lot of pedal cadence front end wobble which may have been caused to some degree by the mal-adjusted front brakes. Seems better now. The BB assembly is slightly out of square so that the derailleur sits crooked. The idler pulleys can come in closer to the main rail – easy fix. The seat does need a buttocks pad, but otherwise works as I envisioned. The bolsters keep me well contained and I can corner it quite sharply even at 12/13 mph. Overall, I’m quite pleased with how it turned out. It’ll probably never be done as I continually make running changes in the hot rods. The wheelbase ended up at 45-1/2″. I could have squeezed maybe another inch – inch and a half out of that by moving the upright for the dropout back more. Another way to save a little more space might be use a seat post with the elastomer in it in place of the shock/spring. I’d like to get a suspension SF down to a 40″ wheelbase. This bike is nearly done, but I will build another with higher grade parts secured first, then match drop out width as required for the wheel, etc. Next winter’s project. 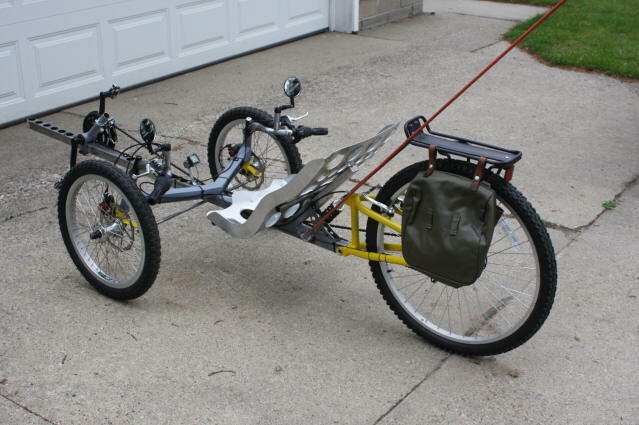 The StreetFox Recumbent Trike is a fast and comfortable version of the classic “tadpole” style trike (two wheels in the front), which includes rear suspension, three wheel braking, and 26 inch rear wheel for optimal gear range. The StreetFox looks and handles as good as any commercially produced trike, and can be completely made using commonly available and inexpensive bicycle components and some square tubing. Not one single machined part is needed. The StreetFox has an adjustable bottom bracket so it can fit riders of most heights, from 5 feet to well over 6 feet tall. Due to the rugged construction and use of sturdy 14 mm axle, 48 spoke front wheels, the StreetFox can easily accommodate riders over 250 pounds. Because this project only requires a basic welder, an angle grinder and a hand drill, the StreetFox can be built by anyone with the desire to put a little effort into this rewarding hobby. Because of the simple mono tube main frame, the StreetFox is highly customizable, allowing the builder to alter the plan to suit his or her own needs, or simply to try new ideas. The most complex part of the trike is obviously the steering, but the StreetFox uses commonly available and “bullet proof” BMX wheels and hubs, so you don’t need to source hard-to-find, expensive front wheel parts. All three wheels have standard bicycle brakes and cables as well, so you can find most of your parts by salvaging old bicycles or at most bicycle stores. Take a look at our Builder’s Gallery to see other StreetFox examples, including many creative modifications to the plan. Our international builders community ranges from students to retired engineers, but they all have one thing in common – the desire to build their own stuff!